That’s how I feel–as though I’ve been hit by a truck or been in a football scrimmage without training or gear, aching badly all over my body, shaky, and weak. I should be black and blue everywhere, but the only change in my appearance is the puffy dark swelling under my eyes. Yesterday, feeling worse rather than better, I asked Ernie to prepare dinner, which he repeatedly volunteers to do. (We could eat the dinner just as our housekeeper brings it to us from the dining room, but I’m not satisfied with that food and always enhance it.) Shortly before noon Ernie found that he could not get online. Neither could I. Oh, well, I thought, I’ll just have to disconnect and reconnect the modem and wireless router to reset them. But that didn’t work, and I spent two hours on the phone with a gracious Filipino technical support agent before our Internet access was restored. Now using the phone is bad for me. I try to avoid it and I almost never spend more than a couple of minutes on it when I have to. Two hours of struggling to understand her instructions, getting under my desk several times to move cables, brought on severe symptoms. I was so fatigued before we finished that I told the agent I might not be able to continue, I was teary and my voice was quavery. But I knew that if I stopped, I’d have to go through the whole trouble-shooting, trial and error exercise again. So I persevered. I was already in a depleted state when this happened. No telling how long it will take for me to recover from THIS. Last weekend I spent a total of 19 hours over three days with my family. Socializing and making conversation has more negative impact on me than any other activity. Although I felt okay most of the time, before the crab feast ended on Saturday night, I realize in retrospect that I was experiencing mind fog. Just as one loses vision in an actual fog, so I lose cognition after exertion or stimulation. It’s as though I’m having to push my mind through heavy mud. Very effortful to make it work. Consequently, the visit with my family really put me down. Conversation is my biggest trigger as well. It took me quite some time to make this connection. I also find that it is very difficult for others to understand. I’ve been watching a BBC TV series on the Human Brain and purchased the accompanying book and flicking through it I noticed a comment on how much work the brain must perform in our social interactions. A huge proportion of our brain is used when socializing. The author goes on to say,”In fact, social interaction is one of the most taxing parts of human existence”. No wonder conversations are so tiring! So that’s my report for today. It is really hard to get a good photograph of this little piece. This was taken with flash and it is a little closer to the actual appearance. The gold and the colors show better here. 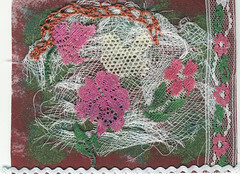 This will be a card for Marge, who has been caring for her 83-year-old beloved companion for eight years. Although he is now bedridden in the Care Center, she continues to take care of him every day. Over painted Lutradur, lacking a sewing machine, I glued scrim, laces, and ric rac, which I painted. then painted over the whole surface with an antique gold acrylic wash. 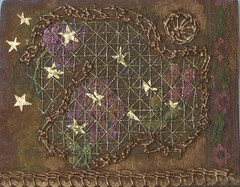 Using Golden Quilting paper which I thought would separate easily from the stitching, I added matrix filling stitches with gold metallic thread . Then I found that I had to tear the tissue paper with a needle and lift each square off with tweezers. Not fun! Over this I glued gold foil stars. 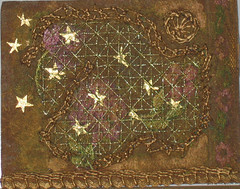 Finally, I highlighted the stitching with Treasure Gold. 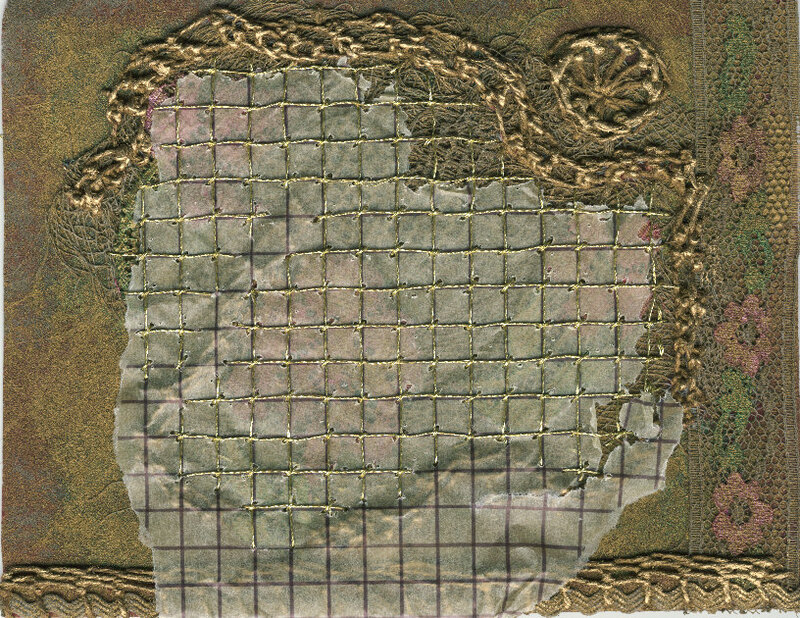 Stitching through all those layers of fabrics, glue, and paints on the Lutradur was like stitching through leather. Very difficult. A week after the big event, I’m still suffering post-exertional malaise and worsened insomnia. Here’s hoping I can write about it soon–the visit, that is. I’m getting better, still aching all over, but other symptoms have abated somewhat and I got to sleep at 10:15 last night–an accomplishment! I’ve been resting four hours a day instead of my usual three hours. 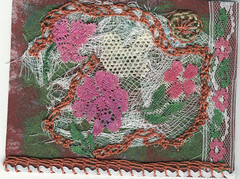 The worst thing about PEM is that it keeps me from doing what I want to be doing–stitching. Still, I have managed a half hour a day with a needle in my hand. 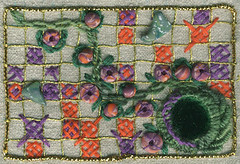 Meanwhile, here’s something to look at– a stitched study to use three TAST stitches–cable chain, shisha, rice, and boss (a variation of rice). I finished it shortly before my son and his family arrived. It also incorporates the clay beads I made when granddaughter Rachel and I spent an afternoon making beads. PEM–post-exertional malaise has set in. The visit with my son and family was wonderful: I’ll write about that later. But now I’m paying for it. I rested more on Thursday before they arrived at 5:30 p.m. and was with them until 10:00 p.m., but couldn’t get to sleep until 1:00 a.m. Stayed in bed and rested until noon Friday before meeting them for lunch and was with them until Pete took them to his house at 7:30 p.m. All the time I felt fine. I rested for three hours on Saturday before Skip picked me up at 3:15 p.m. to go to Pete’s house, an hour’s ride, for the crab feast. There, although I felt fine, I lay down in the guest room for half an hour before the crab steaming began. Except for a brief period of feeling shaky, woozy, and muscle pain, I was okay. Then the adrenaline kicked in and I was all right again. At 9:00 p.m., when they all decided to watch the video of Caleb’s and Lauryth’s wedding, I lay down again for 40 minutes or so. Sunday, even though I felt fine due to the effects of the adrenaline rush at the crab feast, I rested more than usual. I knew I couldn’t avoid PEM, but I hoped I might be able to prevent it from being as severe by resting more. At 4:30 p.m. it hit–eyes burning, muscles tense and aching, shaky, heart palpitations, woozy, and a feeling of overwhelming emptiness in my solar plexus. Monday it is worse–the eyes, the muscle pain, pelvic pain, general malaise, and emptiness, and I’m resting more. But I’ll just have to wait until it passes. More rest than usual only helps a bit. It takes time–time back in my routine. Just a quick post in response to Allie’s in Stitches most recent post. Allie showed us her fall planting this morning. I’d never heard of ornamental chard. 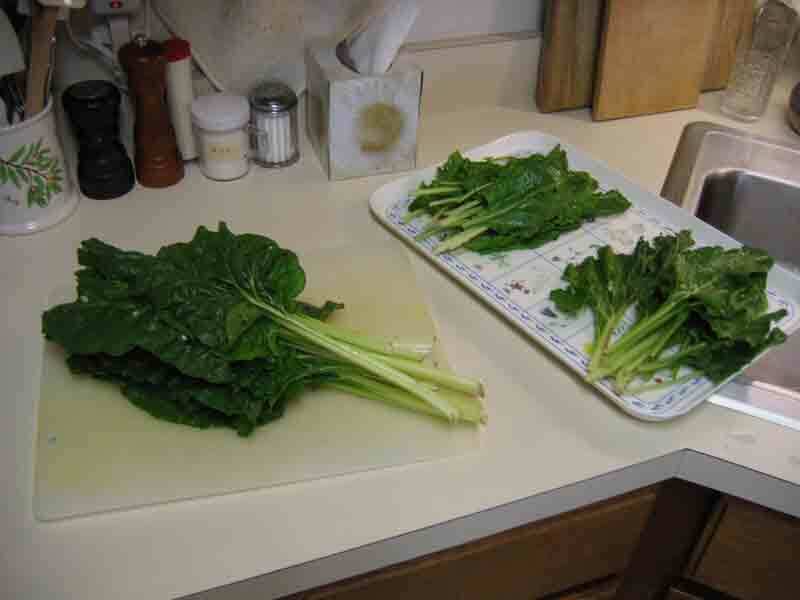 We are among the people who love to eat Swiss chard. After I complained to our housekeeper Ann about not being able to get chard at the local supermarket, she planted some for us in her garden. That was four years ago, and ever since, she has been bringing us Swiss chard. She doesn’t eat it, she just grows it for us. She also brings us green beans, tomatoes, zucchini, cucumbers, and peppers from her garden. 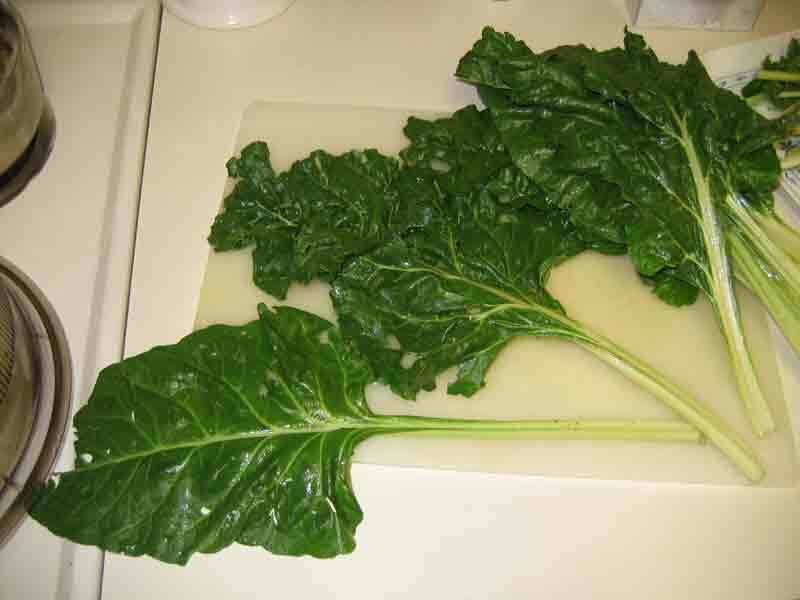 Notice that this Swiss chard is obviously organically grown! And so good!